Each grievance report can record and track more than 40 specific fields including multiple important dates, employer data, and member data. Keyword search all grievance data or specific data fields quickly and easily. Filter search results based on multiple options. Receive email notification or text message notification reminders when important grievance review dates are approaching. Keyword search all contract documents. View hierarchy results and keyword highlighted text specific to each contract. Access can be limited to view only status, editor status, or administrator status. 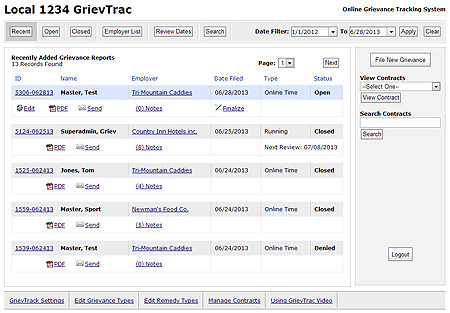 With GrievTrac you can take grievance tracking to a whole new level. The GrievTrac system allows you to efficiently research, collaborate, share, archive, and directly facilitate the grievance process online. Enter and track each step of the grievance process. Receive notifications of key step dates. Upload documents for each step. Enter grievance statement and general remedy text specific to your organization. Set the specific grievance types, remedy types, and other details required for your reporting. Connect using SSL encryption for secure transmission of grievance information. Member data is encrypted for even more security. Access grievance information from any computer, tablet or mobile device. Quickly view the most current grievances in a list format, show only open grievances, only closed grievances, grievances that are coming up for review, or grievances within a specific date period all with the click of a button. Watch the video below to learn more. The video is a general walkthrough showing the GrievTrac controls and navigation through the system.